The first and only newsletter devoted exclusively to the Atari VCS/2600. It ran for 100 issues, from summer 1990 to July/August 2005. After the first 50 issues, Russ Perry Jr. took it over from founder Tim Duarte. Starting with issue #77, Al Backiel took it over until the the final issue. The Allentown Bethlehem Easton Atari Computer Enthusiasts newsletter. Based in Whitehall, PA, it was published bi-monthly. This is Activision's own in-house newsletter, which only ran for 2 years. At least one magazine issue was released (subtitled "The Magazine for the Next Generation"), which focused on their game, Little Computer People. A dedicated newsletter from Lucasfilm Games (who later changed their name to LucasArts) that was published in a newspaper-style format. From the creators of Electronic Games magazine came this bi-weekly newsletter, created as a way to stay on top of the latest video gaming news. According to Bill Kunkel, this was 100% Joyce Worley's work! After V1N26, the name was changed to Hotline. It ran for another 27 issues, with V3N1 being the last one produced. A bi-monthly newsletter (that referred to itself as a magazine) that was published in Salem, NJ by Damon Walker. Atari's newsletter for coin-op distributors and operators. One of Atari's internal newsletters - this one is for the coin-op division post-Warner. This newsletter was for retailers and distributors. Hard-to-find publication, made exclusively for Atari owners in Belgium. Another rare 'zine, this one for owners in England. Starting with issue #21, the name was slightly changed to VCS Owners Club Bulletin. This was Britain's version of Activisions. "CGL" was dropped from the title, starting with the third issue. The sixth and last issue was renamed to Activision Software Club. Started by Jeff Adkins and Scott Stilphen. It ran from late 1991 to 1995. A newsletter devoted to the Atari home computers. It ran in the mid-80s, from 1983 to at least 1986. They also also offered disk-based software much like Antic and A.N.A.L.O.G. magazines did. The latest issue I have (Volume 3, Number 6) shows a slight name change, to CompuClub News. The original DP team of Joe Santulli, Kevin Oleniacz, Bill Schultz, Howard Hirsch, Karl Youngman, and John Annick started this 'zine in the fall of 1991. The first 50 issues are presented here, along with some extras. Issues #50-#65 were helmed by Dave Giarusso. Jeff Belmonte took over from there, starting with issue #66. Hard-to-find publication, made exclusively for Atari owners in France. Imagic's own publication, which only lasted for 2 issues. Mattel's own publication, which only lasted for 6 issues. A Brazilian version was produced in 1984 and based in São Paulo, but it only lasted for 2 issues. Subtitled "News and Views of the Industry". This was a companion newsletter to the Leisure Time Electronics magazine. Subtitled "The Monthly Home Video Games Review". This was published in a newspaper-style format. Infocom's classic 'zine from the 80's. When The New York Times newspaper cried foul over the name, it was briefly changed to "****" before being renamed The Status Line. N.W.P.A.C. 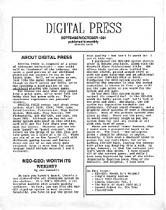 Atari 8-bit Club Newsletter, published by-monthly by the North West Phoenix Atari Connection. A UK-based newsletter for Parker Brothers VCS games. Based in Beaverton, OR, the PAC covered the Atari 8-bit and 16-bit computers. They also had a BBS. Sente Technologies' newsletter for coin-op distributors and operators. Soon after Sente's debut, Bally purchased the company and it became the Bally Sente division. The name change was reflected in the 2nd issue. Atari's first in-house newsletter, which truly captures the philosophy and culture of the company in the beginning, before corporate America took over. Check out that original logo! A monthly newsletter published out of North Hollywood, CA, and started in April 1982. With the February 1984 issue, the name was changed to Computer Entertainer, with a section devoted to video games (under The Video Game Update name).